Mace has been given a task, and he’s never been one to leave a job half done. When Mace’s father announces that it’s time his sons settled down and began having children, Mace immediately begins to weigh his options. His preference for male lovers presents a challenge, but the universe is a big place, filled with many different kinds of beings. Mace takes a chance on his next mission, only half believing he’ll have any luck finding a mate, and unexpectedly discovers the passion he’d never even realized he was missing in his life. Mace’s Rebel’s the first book in the Mate Me series by Victoria Vallo. The Mate Me series is going to be a three book series. Each book’s going to be about one of the three brothers (Mace, Alric, and Tore) as they go about fulfilling their dad’s ultimatum in order to inherit their part of his shipping business when he retires. So what’s the ultimatum you ask? They each must produce an heir, and as Mace got clarification, and his dad doesn’t care if the baby is blue or has tentacles so long as the baby is raised with his son’s family. 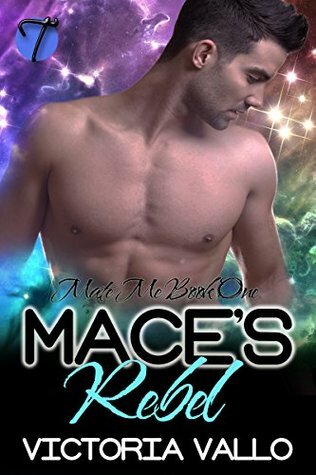 What the dad doesn’t realize is that his sons all prefer men instead of women and so in Mace’s Rebel we get to see how the oldest son, Mace, goes about finding a mate to have a child with. Mace’s Rebel’s a cute story with a great storyline and well-developed characters. I loved how Mace navigates around his father’s ultimatum and still manages to stay true to his sexuality. I loved how Mace finds the perfect mate in The Rebel, Finn. I can’t tell you a whole lot about Finn as it would spoil a lot of the book. I can tell you that Finn is everything that Mace has been looking for and Finn is hot and dreamy and stubborn and kind and supportive and did I mention hot and dreamy. I loved this cute story and all of its steamy hot passionate scenes.